Ha Long Bay (also "Halong Bay") is in northern Vietnam, 170 km (105 mi) east of Hanoi. The bay is famous for its scenic ocean karst topography and is often included in lists of natural wonders of the world. Ha long Bay is a bay located in the area of the Gulf of Tangkia, north of the Socialist Republic of Vietnam. It has an area of 1,500 square kilometers and has a coastline about 120 kilometers away from Hanoi. The name was based on the pronunciation in the Vietnam language "Viet Nam Ha Long". "Ha Long" means "Bay of Descending Dragons", though prior to the 19th century this name was not recorded in any document or archive. When mentioning the present-day Quang Ninh Sea or Ha Long Bay, old historical books often referred to them by the names of An Bang, Luc Thuy or Van Don. Not until the late 19th century did the name of Ha Long Bay appear on a French Marine Map. The Hai Phong News, a French newspaper of the time, had an article, Dragon appears on Ha Long Bay, reporting the following story: In 1898 a sub-lieutenant named Lagredin, captaining the Avalanse reported seeing a huge sea snake on Ha Long Bay. This was also witnessed by many of the crews. Thus emerged the European image of the Asian dragon. Whether this appearance of a strange animal looking like a dragon resulted the name of Ha Long Bay is not known. In Ha long Bay, there are around 1969 limestone rising from the sea. On top of each island has a massive amount of trees. There are several large caves located within the island. The biggest cave in the Bay area is a wooden cave, formerly known as the Grotte des Island. The largest islands in the Bay area Gad bah Island and Tuan Chau Island. There are people living permanently in these islands. On these islands, there are many beaches and hotels serving the tourists. Some small island is the Habitat of several animal species, such as chickens, antelope, wild monkeys and species of lizards. These islands are named from the shape such as Koh Chang, Koh Kaichon, Koh Langka etc. The official organization which promote Halong Bay and provide help and info on the destination is Discover Halong, the team can be found at . How to travel to Halong Bay: There is a bus from Hanoi to Halong city, 160 km away, takes roughly three and a half hours and from the bus station to the pier is about 15 minutes. Then you can go to the ferry pier which has the boat to go to Koh Gadbah island. Another choice is driving from Hanoi to Haiphong province. From bus station to the pier, it will take 10 minutes. Then, you can ride boat to Koh Bah which will take two hours. From Bai Chay to Ha Long City/Tourist Wharf a motorbike taxi should cost 20,000 dong. From Bai Chay to Tuan Chau Wharf a motorbike taxi should cost 40,000 dong. From Ha Long City to Tuan Chau Wharf a motorbike taxi should cost 30,000 dong. By open bus: $15 USD one way, pick up & drop off at Bus Station. However, this is not the ideal way to travel for international tourists. By Seaplane: Take a seaplane flight from International Noi Bai Airport, Hanoi to Halong Bay for only 45 minutes. Enjoy fabulous aerial views over the countryside and experience the thrill of a water landing at the Tuan Chau Island Marina. The flight can be extended to include an additional 15-minute scenic tour over the bay, which allows you to enjoy a bird’s eye view (150-300m high) of the thousands of limestone karsts jutting up from the jade green waters and see remote fishing villages before landing at Tuan Chau Island Marina. This is the one and only seaplane service in Vietnam. USD$175 one way. By shuttle bus: Pick up & drop off passengers in the Ha Noi old quarter. 4-6 hours pending on how many stops en route the driver makes to pick up/drop off passengers. Fare is about US$10 each way. Normally, cruise lines like Paradise, Emeraude or Bhaya in Halong Bay include two ways shuttle bus in their package. By Private car: Cat Ba Express is recommended. Travelling by private car is considered the best choice due to its flexibility, safety, quality and valuable rates. It also seem be uniquely way to reach Ha Long bay from Noi Bai airport despite the taxi collection as it is indeed unsafe enough because of old age, careless drivers and non-competitive price. Some provider: Avis Vietnam, vietnamairporttransfer.com, Rental Car... You can also book a private car through app like Uber, Grab, fee will be shown on the screen. There are many package tours to Cat Ba Island from Hanoi, Standards on these vary considerably: while comfortable - or even downright luxurious - boats, excellent food and knowledgeable and enthusiastic guides may be available, most are characterised by long and crowded bus journeys, tourist-oriented rip-off trips on boats so slow you could swim faster (to get you to buy more food and drink on board), hard-sell 'add-ons' like brief stops for kayaking, 'water cave' visits and other shady practices. So if you must visit Cat Ba, simply avoid the tourist port entirely and cross from Haiphong or another port. Cat Bi International Airport in Haiphong is roughly 2.5 hours away from Ha Long city by road. The metered taxi fare is approximately 850,000 VND but you should be able to negotiate a taxi for under 800,000 VND as there are likely to be more than one taxi operator competing for your business. If you ask around HaiPhong how to take a bus to Ha Long you will most likely receive two answers: Lac Long and Ben Binh. Lac Long is cheaper and a local bus station; Ben Binh is the next to the ferry and are only tourist buses. They are down the road from each other. If at Ben Binh, simply follow the curve closest to the ferry docks. Lac Long is a 5 minute walk away on the right hand (west side) of the street. A local bus from HaiPhong to Ha Long at Lac Long bus station is about 70,000 VND per person. This bus will drop you off 2km away from the tourist area. Moto operators will be waiting there and will try to be very aggressive for they are connected with certain hotels. Walking to the tourist area is a matter of following the main road perpendicular to the highway. A moto should cost 15,000 VND per person from the bus stop to the tourist hotel strip, though they will try to charge you 5 to 10 USD. Halong City, spanning a portion of the northern part of the archipelago. Note that there are multiple ports within this town, in that at least one port exists that is wholly distinct from that of the tourist boat piers. Cai Rong, a small port serving the north-easterly part of the archipelago. Although you can visit Ha Long Bay all year round, you'd better plan your cruise carefully. Bad weather affects the visibility and can even spoil your trip. The best time to visit Ha Long Bay is from March to June, avoid crowded public holidays (30 April and 1 May). June to September is low season so you can get better deals but pay attention to storm forecasts. October and November is high season again and it is still sunny. December is cool, cloudy but dry while January and February are cold, foggy and drizzly. The showers will hide the splendor of the bay. The huge array of slow 'junk' tour boats for package tourists from Hanoi depart from here for Cat Ba Island. As most people taking these boats are on pre-booked tours, the piers are not set up for independent travel; you will be approached by hawkers wanting to make a quick buck by selling you tickets for a premium: avoid these guys. What you want to do is get yourself a ticket from the row of counters inside of a building near the waterfront. Tickets are 80,000 VND for 'route 1' which is the standard way to get over the Cat Ba. Wait around there with the locals (the group easy to identify as "not lost looking western tourists") until something happens. For individual tourists not on a tour package from Hanoi, "licensed" agents will approach you upon arrival at Bai Chay Wharf to sell cruise packages to you. Starting prices (for a non-Vietnamese Asian) are 500,000 VND for a 4 hr cruise (for which you will receive an 80,000 VND cruise ticket) and 800,000 VND for a 6 hr one. If you want to avoid the hassle of buying tickets yourself and not looking like a lost sheep not knowing which cruise to take, do your best to bargain. You could approach the ticket counter directly if you have a Vietnamese-speaking guide along, and the rates will be much lower (remember, it's an 80,000 VND ticket), but be prepared to pay higher than the value stated on your ticket due to other surcharges such as mandatory insurance. The tourist boats just stop at an island with two poorly preserved caves, and passengers are hit up for overpriced beers and kayaking ("the water cave") along the way; the whole ordeal takes four or five hours and is really best avoided unless you've never seen a cave before or want to hang out with clueless gap-year tourists. You can talk with the guide, who takes a tourist group on the pier, buying cruise or transfer to Cat Ba with him directly. If they have empty rooms on the boat, they will happy to take you. 2 day 1 night all inclusive cruise is less than 40 USD. An old report claims "There is another government-run ferry leaving the tourist wharf at 12:00 daily costing 100,000 VND per person and takes 5 hours. A medium quality, 3 day / 2 night cruise including one night on a boat (they may say it is air-conditioned but the air-conditioning is not likely to work) and one night on Cat Ba island in a 2 star hotel including bus transfers to and from Hanoi, all other transfers, admission to a cave, kayaking, admission to Cat Ba national park and all meals (which are OK in quality but nothing special) should cost around 135 USD when booked from a reputable travel agent in Hanoi (or you could try book through your hotel in Hanoi). There are options for cheaper than 100 USD but most appear to be shady/outright scams. Do not book organised tours from Ha Long Bay as they will overcharge you as there is not much competition. When catching a taxi to Bay Chai Wharf at Ha Long Bay many of the taxi drivers will try drop you off at an entrance away from the main terminal where they have friends waiting to try sell you overpriced tours or transfers (be wary if the taxi driver makes a call on his mobile as soon as you are in the taxi). Touts may be wearing identification around their necks to make themselves look official but they are not to be trusted - you are likely to end up on a cheap tour with nothing included (e.g.. no admissions, no transfers on Cat Ba) despite the touts insisting that everything is included. The touts at Ha Long Bay pier will say anything to get your money and should be avoided if you don't want to be scammed. Pre-booking through a travel agent or your hotel in Hanoi will be safer and cheaper. Ban Sen, a thickly forested, almost uninhabited island reachable by ferries to Quan Lan from Cai Rong. Cat Ba, the home of the endangered Cat Ba langur, a national park, numerous caves and the most popular destination in Ha Long Bay for tourists. It can either accessed by local bus and ferry from Hanoi's Lương Yên bus station (recommended), by tourist boat from Halong City (a five hour 'hard sell' ordeal; this is what the hordes of Hanoi package tourists do), or by local bus or ferry from Haiphong (less scenic). Quan Lạn, a historically significant outlying island with the beginnings of some tourism infrastructure and some beautiful beaches. Reachable by ferry from Cai Rong or also (reportedly) from Halong City. Van Don, a large island that is well inhabited, little visited by tourists and connected by road to the mainland near Cửa Ông. Dau Be Island: Visited by commercial cruises to Cat Ba. This is a very popular swimming and diving spot because of its rich coral and deep grottoes with three inland lakes. The grottoes and caves can only be visited by rowing boat at low tide, when access is possible. Dau Go Island: Visited by commercial cruises to Cat Ba. A large and heavily damaged cave plastered with multicoloured lights and concrete. Bo Hon Island: Visited by commercial cruises to Cat Ba. The Virgin Cave (Hang Trinh Nu) is one of the most famous caves in Halong Bay. It is probably best known for its shrine. Accordinng to a legend a beautiful woman committed suicide in the cave, unable to return home after being forced to marry an old Mandarin. Here her body tuned into stone. Another similar legend says this girl escaped from a Mandarin that forced her to marry him because her father could not pay a debt. When fishermen found her body, they buried her here and built a small shrine inside the grotto. Hung Sung Sot Cave is also on this island and has a steep path lined with shady trees. There are two chambers in the cave with a square-shaped outer chamber and a ceiling about 30 metres high. The inner chamber formations look like sentries conversing with one another and another formation, resembling a general surveying his troops, lies in the middle of the chamber. The moving light reflected from the water outside seems to bring these formations to life. Pelican Cave (Hang Bo Nau) is also popular, and many love to take photos of this cave and its spectacular stalactites hanging from the ceiling. It is said that the perfect way to discover and enjoy this world natural wonder is to jump onto a boat cruising to the far-most corners where there are hidden lagoons, unexploited beaches and exotic grottoes that can be found nowhere else in the world. Reality is a bit different. Ha Long Bay is near the major port of Haiphong and therefore suffers from severe water pollution. It is not uncommon to see piles of rubbish floating in the water and the quality of the water can be dubious for swimming. Added there are no naturally occurring sand beaches where the tours tend to go, you will be told the water is safe for swimming regardless of the fact that ships dump raw human waste into the water and diesel fuel is everywhere. Pregnant women, children or people with weak immune systems should stay out of the water. However, the views and the food on board are reasons alone to venture out. 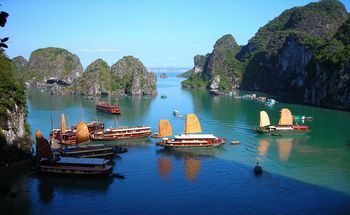 There are two popular cruise itineraries in Halong Bay, day cruise and overnight cruise. Day cruises are created for travellers who just have enough time to soak up the atmosphere and take short glimpse over the must-sees of Halong Bay. Though they are quite short, they include visits to tourist attractions and well-cooked seafood dinner, swimming in the emerald water, kayaking to lagoons of the bay. Overnight cruises which are referred to both one night cruises and two night cruise are designed for travellers who have more time. A typical, one night cruise includes activities such as visits to cave, Islands, Kayaking, funny team building games on beaches, sunset watching with a cocktail party, and night actitvities on board. A two night cruise consists of all the activities of one night cruise and an extra day of further visits the far, untouched corner of the bay on smaller boat with a beach barbecue. Both one night cruise and two night cruise are inclusive apart from drinks. Cruises should be booked directly with cruise lines or official agent to avoid scam. Halong Bay Casino (Royal International Casino) located by the main road to Bai Chay. Walking here can take you about 10-15 minutes from the wharf. Foreigners need to show a passport to enter and there is no deposit required. A coffee lounge with slot machines on the ground floor is open to all while there are two gambling halls, one on the ground floor (which is closed on week days) while the main hall is up on the first floor. Small. Ngan (Vietnamese: Ngan)/ŋaːn1/ (you must say the word in high tone, if you say "ngan" that means one kind of duck). You can find this bivalve molluscs only in Quang Ninh province. It looks like a clam but much bigger, and is claimed to be good for a person's circulatory system. The locals drink it with wine, or cook in porridge or soup. “Gat Gu” (Vietnamese: Gật gù) cake is similar with steamed rolled rice pancake. It is made from rice flour. When making this kind of cake, the maker have a secret to make it more delicious by adding cold rice. In Viet Nam, “gat gu” means nodding repeatedly, so that the name of this cake is “gat gu”. There is a custom that when eating Gat Gu cake, each one will nod repeatedly three time before eating to greet their visitors, and visitor also repeat it to show their thanks. “Gat gu” cake is quite special and delicious. Another fascinating specialty of Halong is Sam - an Arthropod Crustacean. Sam can be used to make a lot of delicious and strange food. Tiết Canh Sam , Gỏi Sam, Sweet and sour stir-fried, sam egg fried with guise leaves, steamed sam, breaded fried sam, grilled cartilage sam, sam fried with vermicelli... Location: If you want to enjoy delicious sam, Gieng Don or Cao Xanh are good choices. Ha belong to the same family with oysters but they are smaller and have scabrous, sharp shells living on the cliffs. Therefore, we must use pointed beak hammer to remove them from the rock, and then break the shell to get the core. Although this step is hard, dishes from Ha are really delicious, especially Ha soup in the hot summer meals, Just 2-3 ounces of Ha with tomatoes, green onions, tamarind of pineapple, you can make a perfect Ha soup bowl without spending too much time. You can also order this dish at the restaurant near Bai Chay. This fish was rated as the most delicious fish in Halong Bay, the main trait to recognize the difference between Three-spined Stickleback and other fishes is 3 spines on its back, the slippery and slimy skin. There are 2 types of Sticklebacks in Halong Bay included: white meat three-spined and yellowish meat one which is tastier and softer to eat. The stickleback can be cooked into many dishes: grilled with seasoning, simmering or braising. Raw materials can be found mostly at the flea markets around Halong city or travelers can taste this fish in restaurants. This page was last edited on 28 March 2019, at 01:39.